Valentine's Day... Oh, Valentine's Day, I'm just too busy for you this year! I forgot how hard it is to be in a play over Valentine's Day. I want to make cupcakes and cool decor and Valentines for the girls' classes. Alas, alack! When??? This is what we did on Valentine's Day, 2010. We were very, very broke. I wanted to do something sweet, though, so I got some cheap cupcake picks, used a tablecloth left over from a birthday party, and made a pretty table. We kept our winter-themed decorations from Christmas, and added lots of hearts, including the paper bag hearts with the lacing and magazine words that we made during one of my storytimes at the bookstore. Our fireplace is bare right now. There is junk on the blower, because no one seems interested in putting anything away right now. (Grrrr...) I see no red or pink anywhere, except for the toys I always seem to be stepping over. Or on. So, this is a little post made up of what little Valentiney stuff I can come up with. Enjoy! At this time, we are making Valentines for the classrooms. Well, we're printing and assembling, anyway. Little Sis has chosen to make these awesome little puppet Valentines, via You Are My Fave. Big Sis's Valentines will take a little more time - we need to make a whole bunch more pom-poms first! I love this free printable/instructions from See Jane Blog. We also decided to give Valentines to the kids in the girls' dance classes. For those, we opted for some store-bought cuteness. I have the girls' Valentine gifts ready. February 14 is also International Book Giving Day, and I have books on order from Little Sis's Scholastic flyer, but I don't know if they will arrive in time. They may. 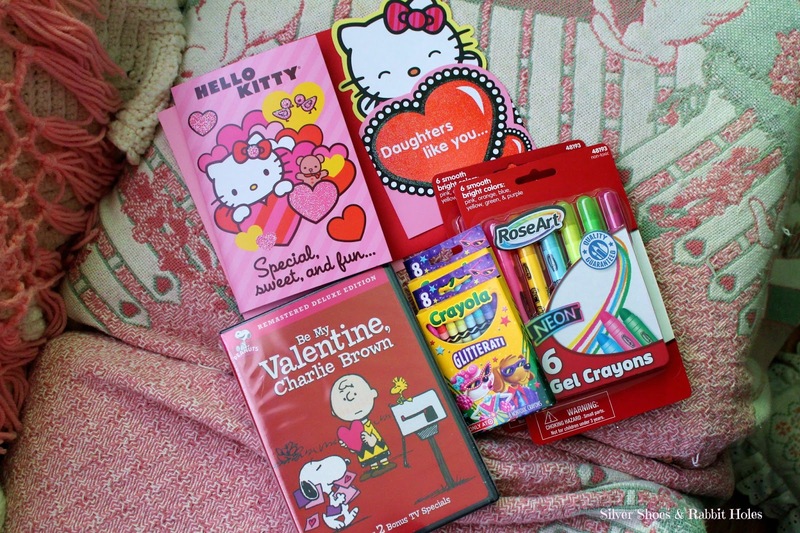 But we got them some glitter crayons, gel crayons, and Be My Valentine, Charlie Brown, too. (Yep, yesterday I wrote It's the Easter Beagle, Charlie Brown. I don't know why. I even linked to it. I don't know where my head is.) I'm excited because the DVD also includes It's Your First Kiss, Charlie Brown and You're In Love, Charlie Brown, two more of my very favorites. 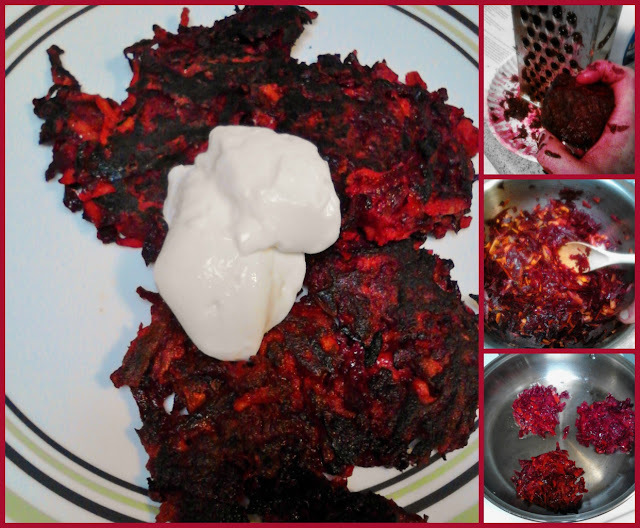 I tried out a recipe for Beet and Carrot Pancakes, which I thought would be beautiful for Valentine's Day. But let's be honest here - the only person in this house who likes beets, besides me, is Little Sis. She tried these, and declared "Nope, I only like beet chips!" These are the beet chips I made at her request last week. I think she ate two of them. I give up. But aren't the beet and carrot pancakes pretty, with their dollop of sour cream? Red and white for Valentine's Day? Perfect if your Valentine likes beets. Little Mouse's Big Valentine by Thacher Hurd. I hope everyone else is having a lovely Valentine's Day week! 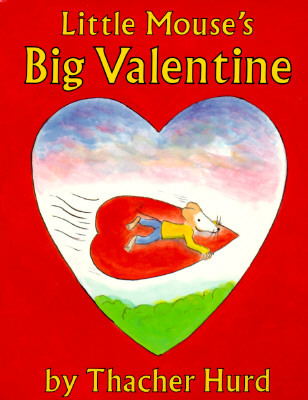 Tomorrow, Little Sis goes to her best friend's house after preschool, so I'm going to Big Sis's school to read a Valentine story or two to her first grade class. (The teacher will have to provide a book. I don't really like any we own!) Her school Valentine's Day party is Thursday, of course. Little Sis's will be on Friday, since she doesn't attend preschool on Thursday. Thank you! I think they'll be pleased with the DVD - they were just talking about that one tonight! Wow this is all so cute and special for the girls! My Keira is having an awesome week at school because tomorrow is celebrations for the 100th day of school, Thursday is Valentines, and Friday is a professional development day - no school! Then on Monday it's Family Day here in Ontario, so no school again! Lots of excitement coming up. Oh how fun! The girls are out on Monday for President's Day, and Big Sis is out again Tuesday for inservice, then she's out early for conferences the rest of the week. Party week, I guess! WOW there's a whole lot of valentine awesome here!!!! 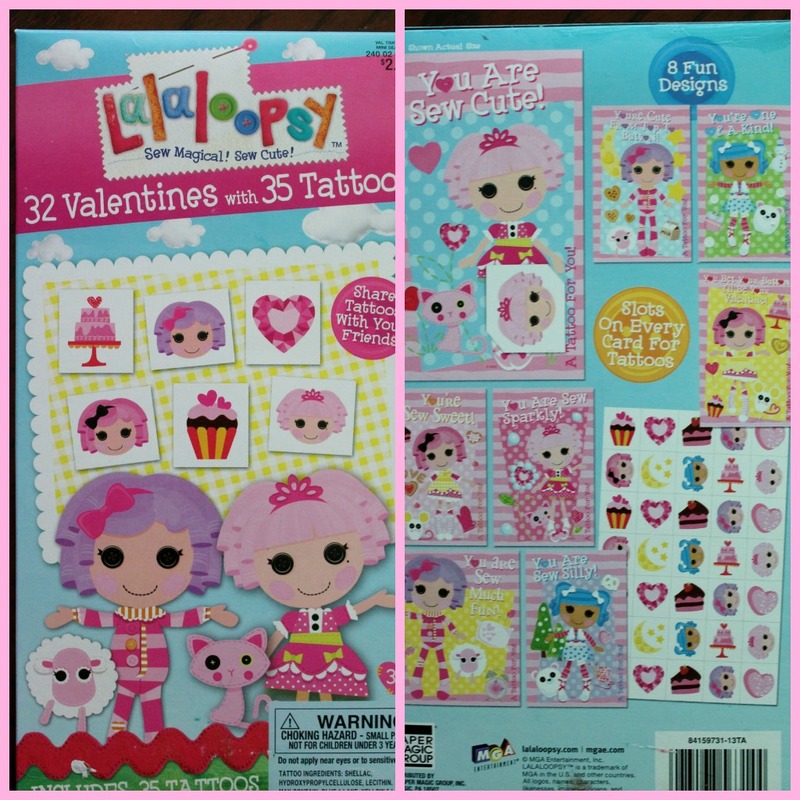 If I had seen Lala Loopsy valentines I totally would have been wanting to get them for J!!! They came with tiny tattoos! They're so cute! I am just not a big time Valentines celebrator! I'll make the kids & husband a sweet treat on that day... but that's about it from me! Husband and I did get to go on a date last night (we rarely get to) we ate out and saw Warm Bodies. Which I thought was wonderfully adorable and very funny! The kids... are giving store bought valentines, and they are happy as can be... so I'm going with it! Good luck with all of the business! 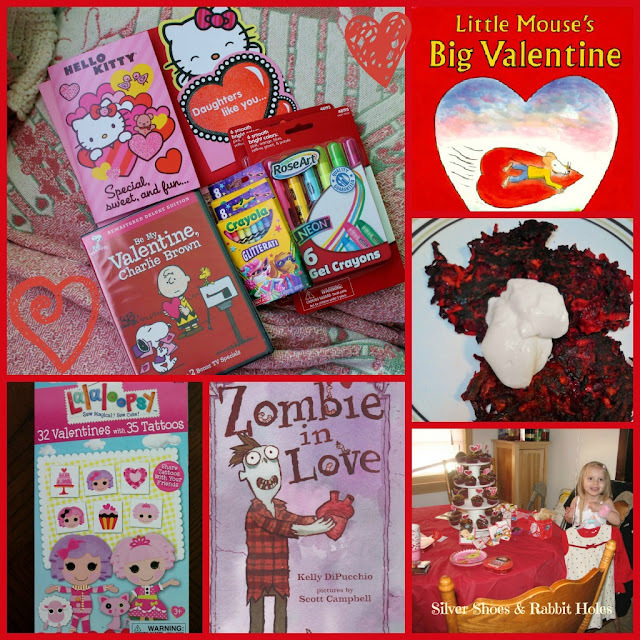 :) Love all the valentine wonderfulness you've shared here! I always referred to Valentine's Day as "Happy Hallmark Day." The husband and I usually let it go. 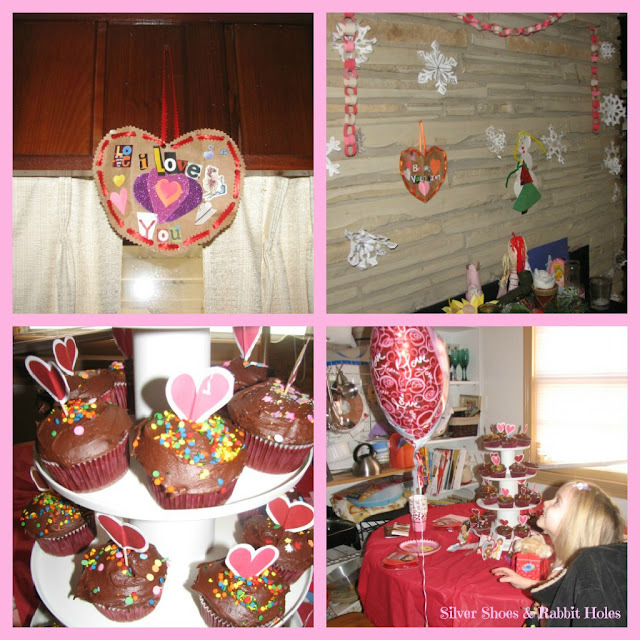 The girls and I were in total stay-at-home-and-craft mode a few years ago, when we were in a major financial slump, and I grew to love the crafty decor part of Valentine's Day. When Mr. B and I finally get a date night, we'll probably say we're celebrating his birthday late, instead of a late Valentine's Day. (His birthday was the 6th.) We don't get date nights very often at all. ;o) Glad you had a good night out! I really loved Valentine's Day as a kid with the school party and everything. Now that I'm an old married person without kids, we kind of forget about it! Today is actually the anniversary of our first date (9 years ago!) so sometimes we get our acts together and go out on the 13th. Oh my goodness, why can't houses just stay clean? I hate doing housework--it always seems like there's something else to do. Yeah, I think I like the kid-centered version of Valentine's Day better. The "romantic" version is usually a bit too saccharine for my taste. Happy Date Anniversary, though!